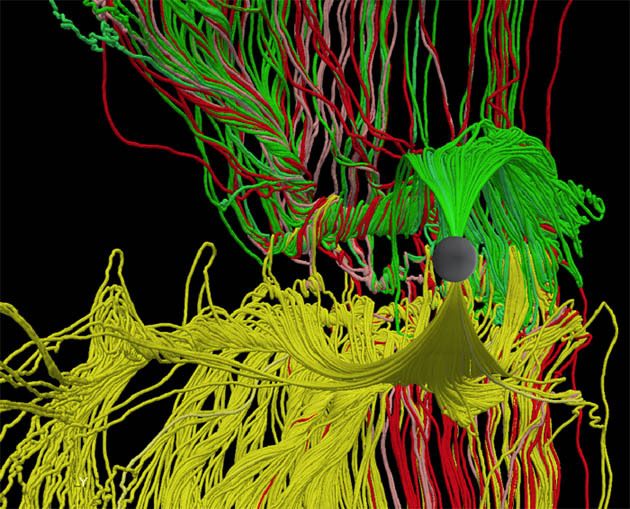 For those that doubted the existence of the flying spaghetti monster, scientists have managed to photograph him. And the reality is more amazing than you can have imagined.. He really is out there floating in space spanning the whole universe. And even better, do you know what the meatballs are? They’re stars and planets. Here’s just a fraction of his majesty, that meatball is our own humble blue marble. Using the awesome power of a Cray XT5 Jaguar supercomputer, a team of space physicists are unlocking some of the biggest mysteries surrounding how the sun’s magnetic field interacts with our planet’s magnetosphere. They basically want to understand what happens when global magnetic fields become tangled to the extreme. Our Planet, Tangled in Magnetic Spaghetti : Discovery News. This entry was posted in good, images, science and tagged blue meatball, Magnetic Fields, Magnetosphere. Bookmark the permalink.